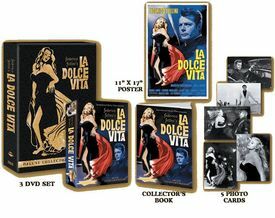 Here it is: Indisputably one of the greatest films of all time, the film that captured a fleeting moment in time and yet defined not only an era but a state of mind, Federico Fellini's La Dolce Vita is now available on DVD. This is the film that pinpointed once and for all the transformation that movies -- Hollywood movies initially, but all of cinema ultimately -- have wrought upon the human soul. We are now all actors in a film, we view are own lives as cinematic spectacles to fulfilled, we are all dying to live la dolce vita.